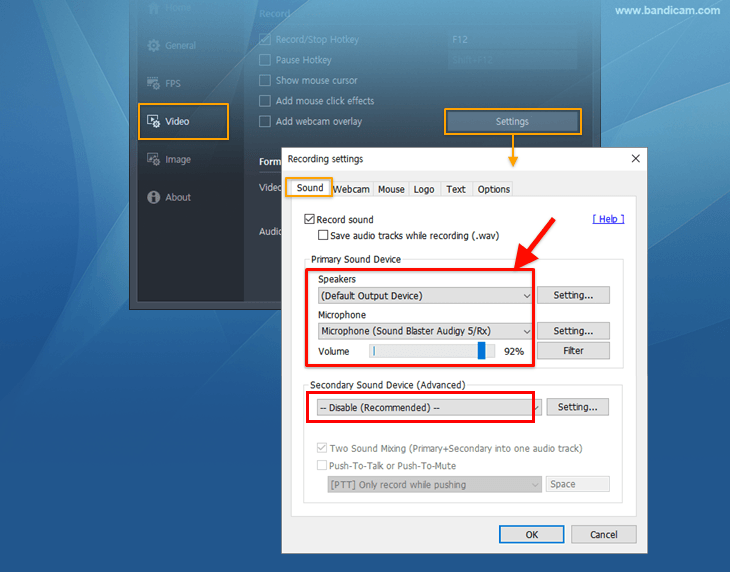 To record your voice, select a microphone as the secondary sound device and check the "Two Sound Mixing" option on Bandicam, and then set the microphone as the default recording device on Windows. 1. Record your voice with the "Two Sound Mixing" option. 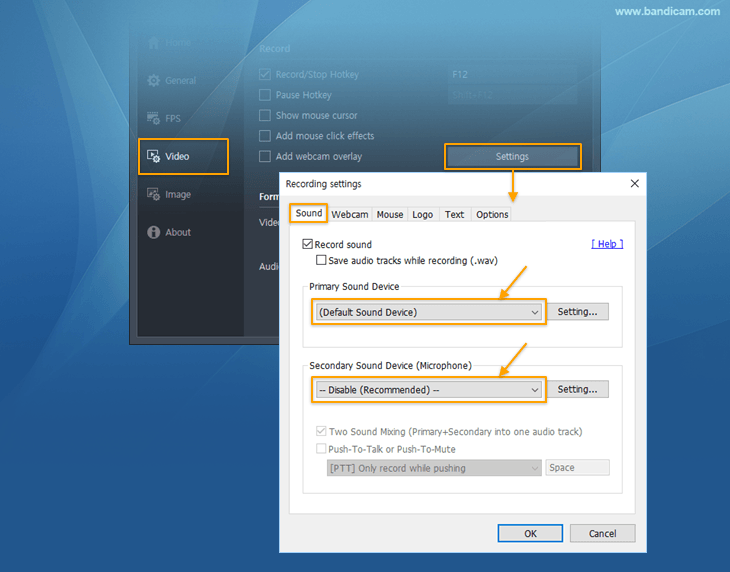 1) Choose "(Default Sound Device)" as the primary sound device and select "your microphone" as the secondary sound device, and then check the "Two Sound Mixing" option. 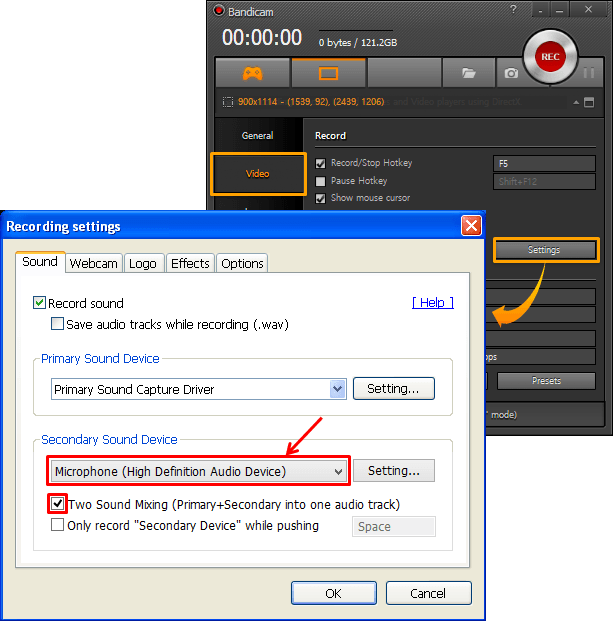 2) Select 'Recording devices' in the system tray, and set your 'Microphone' as the default recording device. 3) Select 'Properties', uncheck "Listen to this device" and set the microphone volume to 70%~90%. 2. Record your voice without the "Two Sound Mixing" option. 3) Select 'Properties', check "Listen to this device" and set the microphone volume to 70%~90%. * If you still can't record the microphone sound, you need to re-install the sound card driver. To record your voice, you have to enable "Microphone" in Volume Control. 1) Start Bandicam, and click the "Settings" button under the Video tab. 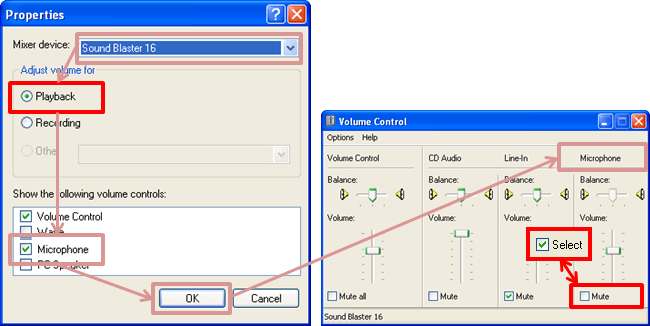 - Primary Sound Device: Select "Primary Sound Capture Driver"
- Secondary Sound Device: Select "Microphone"
2) Select 'Open volume control' in the system tray, and select 'Properties' from the 'Volume control' window. 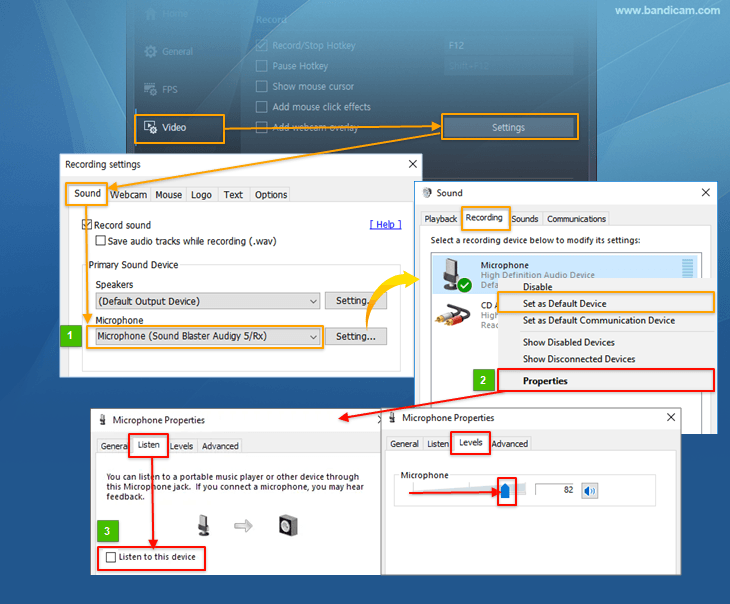 3) Select the "Recording" option, and check the "Microphone" option, and then check the "Select" check-box (or uncheck the "Mute" check-box) of the Microphone tab. 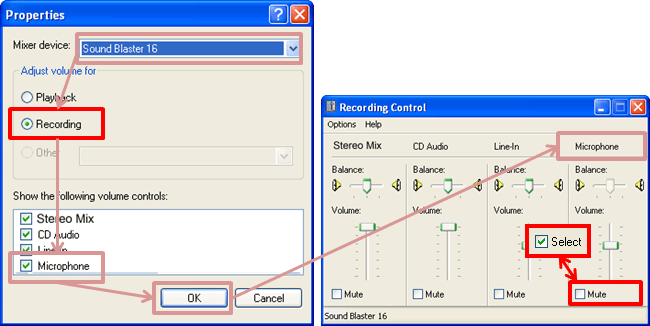 4) If you still have the microphone recording problem, select the "Playback" option, and check the "Microphone" option, and then check the "Select" check-box (or uncheck the "Mute" check-box) of the Microphone tab.